Invited Thai Artists, Australian Artist Rebecca Wilson and Writer Michael Wansbrough were hosted by the National Thai Elephant Institute in Lampang Thailand. 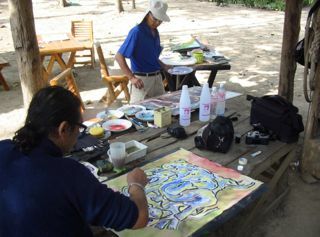 During the three day visit, the artists drew, painted and photographed the elephants and donated works for the exhibition the following year. Over one million Baht was raised for the Institute. The National Thai Elephant Institute in Lampang rescues elephants from around Asia and keeps them in very natural surrounds. Often the elephants are injured or unwell having been maltreated or have become injured (For example, due to land mines.) The institute has a hospital so they can care for & heal the elephants. 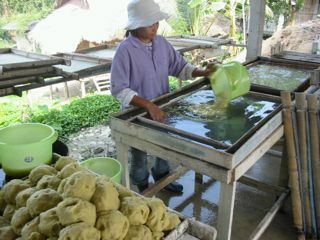 The Institute recycles the dung to make paper which they sell to raise funds, makes their own gas to fuel the centre from the dung and the mahouts stay with the elephants for their whole life. Being a mahout is often a family tradition, knowledge is handed down from father to son. 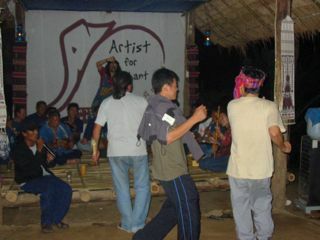 Traditionally mahouts would spend long periods of time in the jungle, they made their musical instruments from their surrounds and used the jungle flora to make whiskey and a whole range of foods etc. They were at one with their land and their animals.